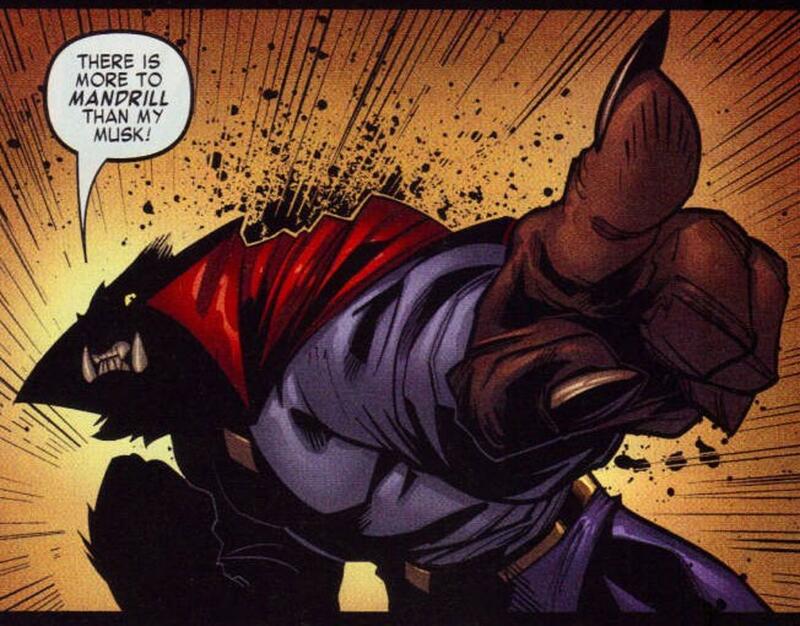 This week’s obscure character is the Dogwelder. Yes, Dogwelder. Dogwelder was a crimefighter who maimed evildoers by welding dead dogs to them. No, I’m not punking you. No, seriously, I’m not. He was a supporting character in the comic book series “Hitman”and a member of Section 8, a “superhero” team led by delusional superhero wannabe, Six-Pack. His face is never revealed and he never speaks. He was, obviously, pretty disturbed. Dogwelder dies in Section 8’s final battle when he is vaporized by acidic demon vomit. It’s like the trifecta of tragedy. Fantastic. This week’s random character is Madam Fatal from Quality Comics (playing it kind of fast and loose with that name, eh, Quality Comics?). 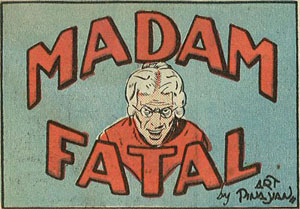 Madam Fatal was comic’s first cross-dressing character (hooray?). When Richard Stanton’s daughter is kidnapped, he uses his acting skill to create a new persona as an elderly lady called Madame Fatal. While dressing up as Madame Fatal, Richard found he was underestimated by his daughter’s kidnappers, and able to get the upper hand. After rescuing her, he decided to adopt the identity and fight for the side of good, becoming the first transvestite hero. Stanton lives alone with his pet parrot Hamlet (are you sure he’s not an elderly lady?). 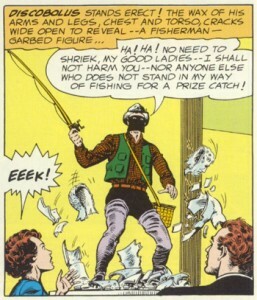 “She” appeared in the first twenty-two issues of Crack Comics. After the line was bought out by DC Comics, Madame Fatal disappeared and was never seen again. Good call, DC. 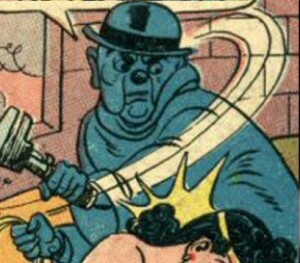 The Blue Snowman is a cross-dressing DC villain. That’s right, folks, there’s a chick under there. Try not to crack a fat. Byrna Brilyant was a schoolteacher in the small town of Fair Weather Valley. Her father, a scientist, died while he was working on “blue snow”, a form of precipitation that instantly freezes whatever it touches. While he wanted to help humanity, Byrna wanted to use it for profit. She was recruited into a team called Villainy, Inc. and was ultimately stopped by Wonder Woman. Maybe they should change the name of their group if they don’t want to be found out as soon next time. 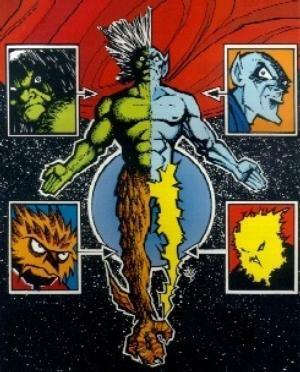 Today’s obscure character is Ultra The Multi-Alien by DC comics. This character came to be when Spacedude Ace Arn is struck by four alien rays at once, turning him into a composite of all four races. But, this composite of 4 races isn’t a mix in one person like you’d expect, it actual causes him to have 4 quarters of his body looking like the 4 different creatures. Most of his story has dealt with him trying to turn back to his human form… you mean chicks don’t dig this? Thanks to Jon and Conan O’Brien of course. This week’s ridiculous character is Sportsmaster by DC Comics. Sportsmaster is an extremely talented athlete that uses his natural athletism for crime. He is a master of all American sports and hand to hand combat. He also uses sports themed weapons of destruction. Do I even need to say anything else? Oh yeah, he wears a ton of different, ridiculous costumes depending on which sports skill he’s using at the time. There were 2 different Sportsmasters – yes, somehow they didn’t learn that this was a terrible idea the first go round. Wow.